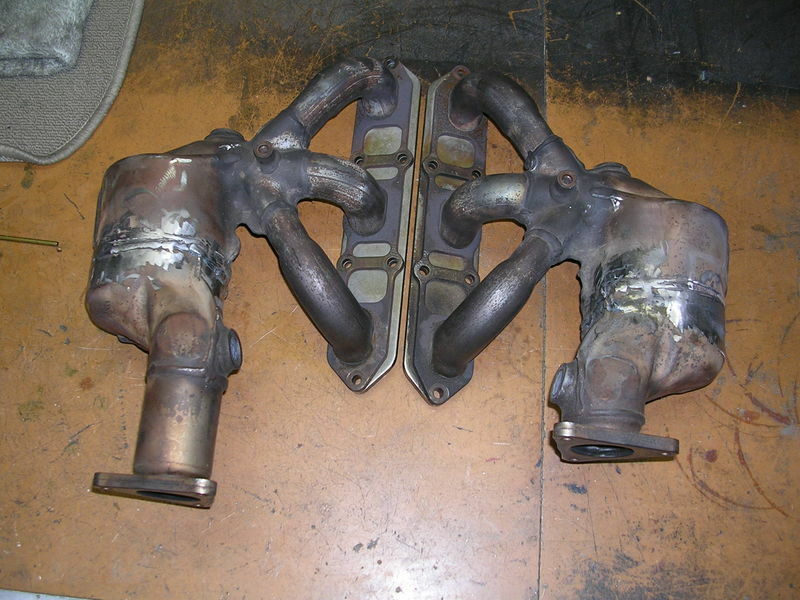 I have a pair of OEM 986 catalytic convertor exhaust manifolds which have been hollowed and gutted. See sequential pictures below. I cut these manifolds apart, removed the internal catalytic convertor elements, and then rewelded the canisters back together. I then had them hi-temp ceramic powder coated in a gold color (just because – everyone else always does silver or black). I used them with fine results for approximately 1000 miles, but now my exhaust work path is leading me in a different direction, rendering these surplus to me. 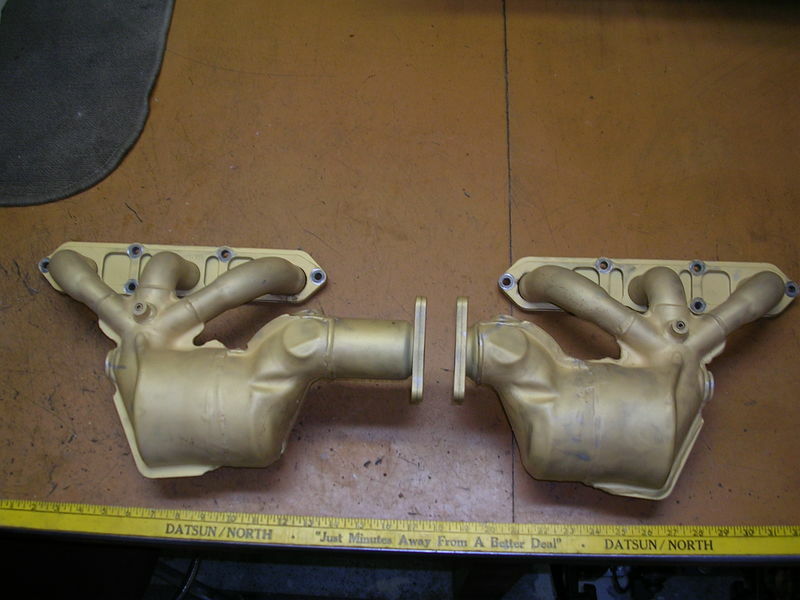 These manifolds are the perfect stealth “pseudo headers” which appear completely stock (well, aside from their gold color, I suppose … ), but which provide a significantly freer exhaust flow. 4) According to my dash on-board computer, I picked up 1-1/2 more miles to the gallon (!!!) in fuel economy. 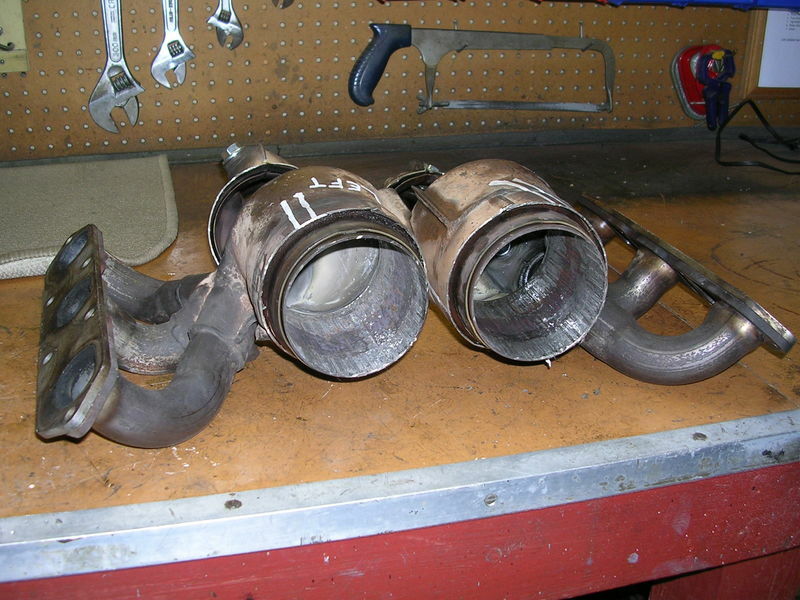 Since these started out as OEM parts, notice that you will not have any fitment, excessive radiated heat, or similar QC problems which one can often encounter with those cheap aftermarket headers. $190.00 USD for the pair, plus lower 48 shipping. And I will even include a pair of new 3-bolt outlet flange gaskets as a freebie bonus. And yes, the disclaimer: These are not smog compliant, so they are intended for non-public highway use only. For sale: A pair of Big Daddy ‘mini cats”. 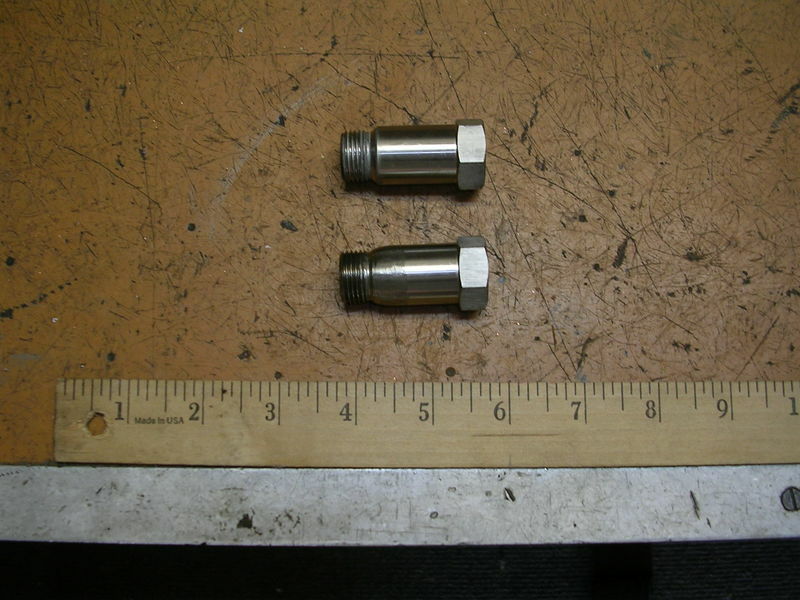 These are described in great detail here: O2 Simulator Mini Cat Cel Fix stainless steel Rear O2 sensor simulator. 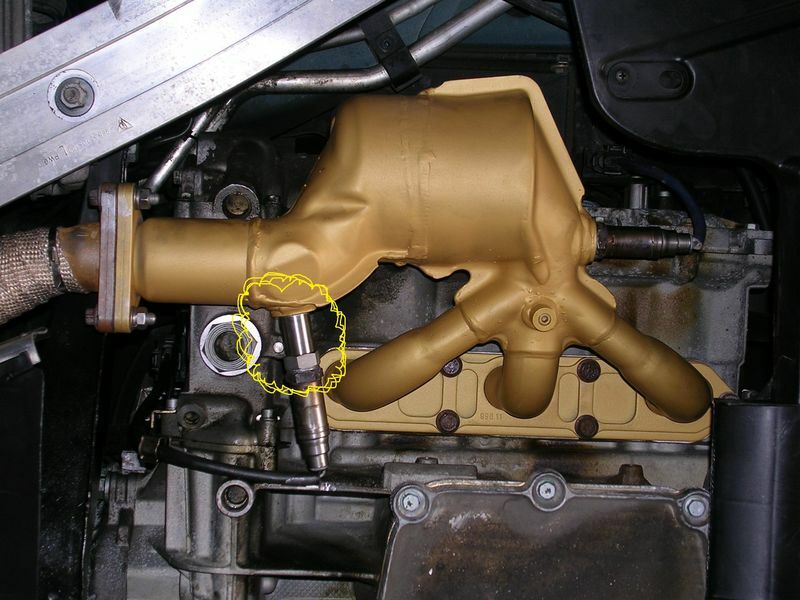 I bought these for use with the secondary oxygen sensors as fitted to the above hollowed manifolds, as highlighted in the pictures below. I ran them for just about 1000 miles, and they worked very well, with only the – occasional -- CEL trigger, depending upon ambient weather temperature and driving conditions. The CEL codes, for those instances when they did show up, were always (and only) P1117 and P1119, which seemed to indicate that the pair of secondary oxygen sensors were running too cold. (Observation: Apparently nothing to do with the chemical content of the exhaust, so these mini-cats do seem to be working exactly as intended.) These codes, for those instances when they did appear, were easily and quickly reset via my Autel scanner. 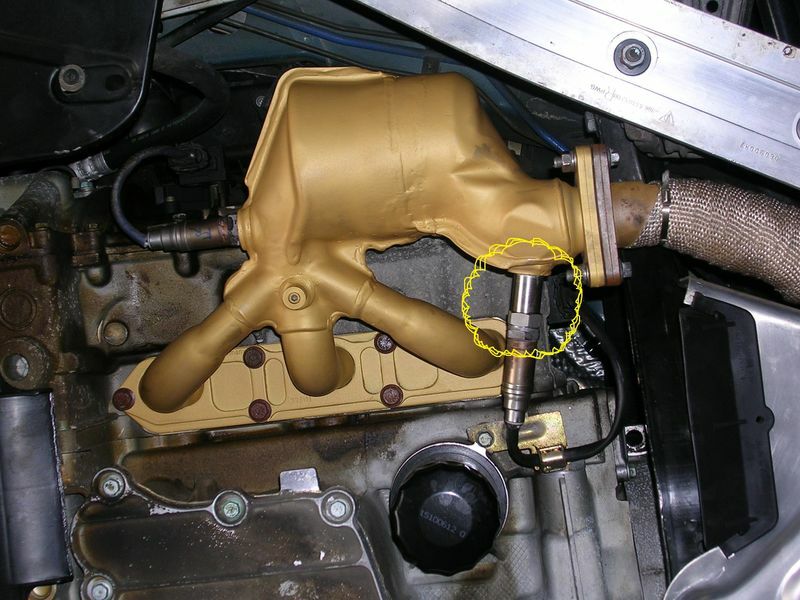 My theory is that I could address these random “too cold” CEL’s by wrapping the sensor and the manifold with a heat insulation wrap, so to trap the escaping heat in and around the secondary sensors and to thus keep them warm (recall that when used with the hollowed manifolds, there is no longer a nearby catalytic cell present to retain heat). But as noted above, I have since headed off in a different direction with my exhaust work, and since periodically resetting the CEL was never a big deal to me, I simply never got around to trying this thermal wrap idea. While this idea seems very plausible to me, and is sincerely offered in good faith, note that YMMV so you will need to try it yourself in order to see how it works for you. 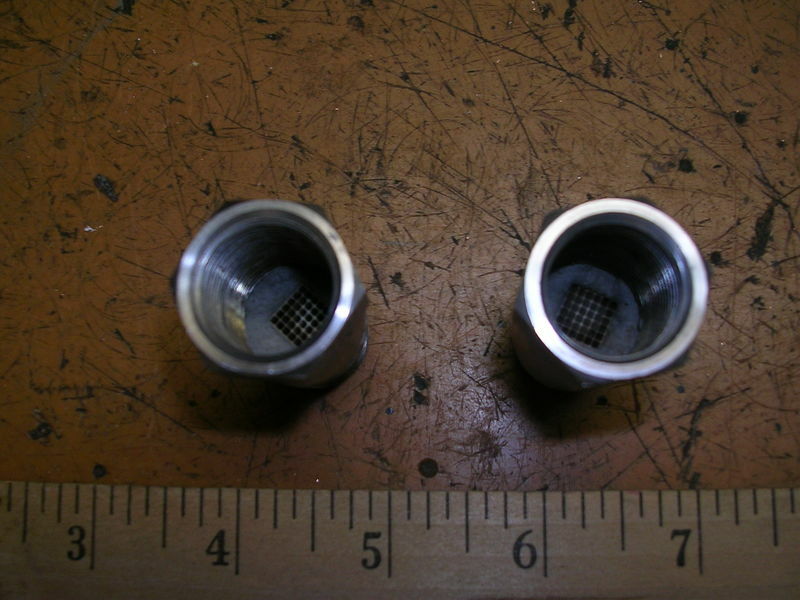 One of the sensors had the stainless steel shoulder at the base of the threads slightly rounded – see pictures – obviously with no effect whatsoever on their operation. And yes, the disclaimer: As well documented at the above manufacturer’s website, these are not smog compliant, so they are intended for non-public highway use only. These mini-cats are sold online at the above address for $49.95 each, so I will sell these at $60.00 / pair plus lower 48 shipping. If the mini-cats and the hollow manifolds are bought together as one package, I’d discount the total cost for all items to $225.00 plus shipping. Oops, I just realized that I posted these "parts for sale" in the "cars for sale" section. My error - Moderators, can you please relocate it? Wouldn't it make sense to change the intake filter to flow more and add a tune? Can you give them a dirty rusted look so the California Star Station smog inspector doesn't give them a second look.